There are countless reasons to add landscape lighting to your home. One big advantage is that you can expand your usable area in the evenings. Outdoor landscape lighting can bring life to your patio after the sun goes down. You are opening up the possibility of using this space to sit and read, use your portable technology, have a family get together, or even as a quiet meditation space beneath the stars. No matter what season, professional landscape lighting can add the perfect touch of elegance to your home. Lighting up your yard will bring an endearing and waggish appeal to any home’s outdoor area. Our landscape lighting Boca Raton FL services can help elevate the beauty of your already beautiful pool with deck lighting. Most pool owners have a single pool light for night swimming during summer months. South FL pool owners have the lucky privilege of being able to use their pool pretty much year round. Landscape lighting can help you and your guests easily enjoy a relaxing, evening swim, while contributing to pool safety within your home. Proper landscape lighting will reduce your pool deck’s potential tripping hazards and illuminate all activity around you. 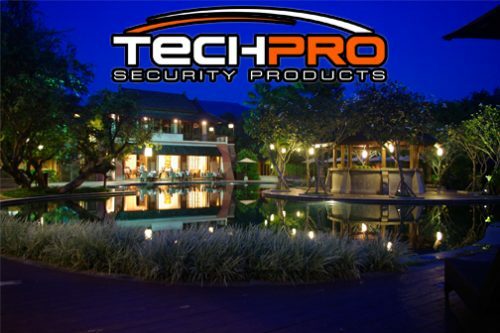 TechPro proudly stands behind our landscape lighting products and services. We privately design and install our products, handling the process from top to bottom and catering to the needs of our customers as they arise. We are industry landscape lighting leaders cutting unnecessary middlemen from the process saving both you and us money. Our products are meant to last for years to come; have peace of mind that your home will remain beautifully well lit after our landscape lighting installation. If you’d like to transform your outdoor space into an endearing social area, landscape lighting is one of the best approaches anyone could take. TechPro can transform the mood of your backyard into an impressive setting for a family and friend BBQ. Aside from the improved aesthetics and functionality of your outdoor areas landscape lighting is a fantastic way of providing your home or business with additional safety and security. TechPro understands that landscape lighting is a highly effective form of crime deterrence. Landscape lighting that will be used as security lighting should be installed with tampering and defacing prevention in mind. Your landscape lighting for security should be placed relatively high or have protective covers preventing breakage. Another aspect of the installation one should consider are the options you will have for your landscape lighting’s control options. Photoelectric sensors work by monitoring and detecting changes in light. The sensors also referred to as photoeyes deliver an automated lighting solution from sunset until sunrise. The are advantageous to traditional timers which need to be adjusted every six months, calibrating to daylight savings, in order to achieve the same effect. Motion sensor lighting in the best choice when opting primarily for security automatically switching on when detecting any movement. Motion sensors are ideal for alerting homeowners of a possible threat while effectively scaring off unsuspecting criminals. If you have questions about our landscape lighting Boca Raton Fl services or would like to schedule an installation call our toll-free line today (866) 573-8878.